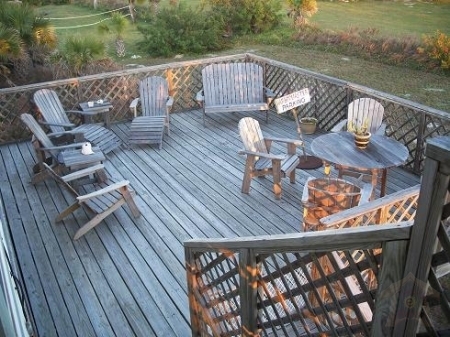 Our Island Getaway is a 3 bedroom, 2 bath house located on a half acre of land. It is ideal for 3 couples or 2 families to rent. An upscale, yet comfortable beach house rental.Port Aransas is a wonderful place to visit, whether your interests are fishing, hunting, beachcombing, shopping, eating, bird-watching, or simply doing nothing at all. We hope that we are able to be a part of your Port Aransas vacation! If you are interested in wildlife, the excitement begins with the ferry ride over to the Island. Keep your eyes open for dolphins, jellyfish, pelicans, and of course the ubiquitous seagulls and cormorants. There are several bird-watching areas on the Island, where you can see birds, turtles, nutria and occasionally an alligator. You can also take a dolphin spotting cruise if you so desire. There are some excellent restaurants on the Island. We have a collection of menus in the house that you can peruse when deciding where to go eat out. If you have caught your own fish, you can use the fully equipped kitchen to prepare a feast, or take it to one of the local restaurants which will prepare your catch. If you want to rent buggies or bikes, there is a rental shop on the Island. For an easy day trip, you can drive over to the city of Corpus Christi. Adults and children alike enjoy the Texas State Aquarium, and USS LEXINGTON. In the other direction, toward Rockport, is the Aransas National Wildlife Refuge. The endangered Whooping Crane winters here, but there is wildlife to be seen all throughout the year. Bay fishing and off-shore fishing are both exceptional. During the Fall and early Winter, duck hunting is a popular sport in the area. Let us know if you are interested in the name of a duck hunting guide, or a fishing charter or guide. Beachcombing is popular on St. Joseph Island (locally referred to as “St. Jo’s”). There is a ferry which can take you over to this undeveloped island. There is an eclectic mix of shops on the Island, ranging from local craftsmen to megastores. So, whether you are looking for an original piece of pottery or a clamshell nightlight, you should be able to find it in Port Aransas.